And of course as a huge baseball fan, a trip to Louisville isn't complete without a trip to the Louisville Slugger factory and museum to see how major league bats are made. One of the great things about the Louisville Slugger tour is that it has a live batting cage where you can swing wood bats with the same dimensions used by legends like Ted Williams, Ty Cobb, and Stan Musial. Feeling a bit overconfident after the tour, I decided to give the massive 35-inch, 33-ounce Ted Williams bat a try. Unsurprisingly, the results weren't pretty. I was used to a much lighter and somewhat shorter bat and struggled to react to the pitch as it came toward me. The Splendid Splinter would have had a good laugh, but it was a fun experience nonetheless. In investing, as with hitting a baseball, we often end up looking silly when we step far outside our comfort zone. Just as I had poor results swinging the wrong kind of bat, I'm likely to have poor results investing in the wrong type of stock. Now, a type of stock isn't "wrong" in itself and other investors may do quite well with it, but it might not be "right" for me. For example, I'm not very good at analyzing and investing in early stage technology companies. The reason I know this is that I've been around people who are good at it and I don't share the necessary vision, risk tolerance, and emotional discipline to do it as successfully as they do. On the other hand, they'd probably get impatient with dividend investing and make their own set of errors. To each his own. Whether you're more suited to one type of investing or another is neither good nor bad. One of the most important things to learn as an investor is to recognize what you're not good at and then avoid doing those things. 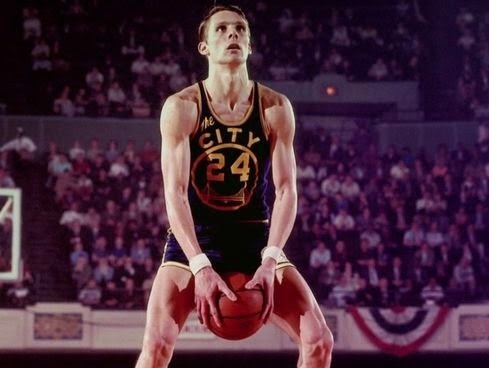 A few weeks ago, I came across a video* about basketball legend Rick Barry who had a rather unorthodox way of shooting free throws. He shot them underhanded, or as we called them on the playground, "granny style." As you might imagine, Barry got a few laughs and taunts from fans, competitors, and the media when he began shooting this way. He did look a little ridiculous, after all. Barry got the last laugh, however, making 90% of his career free throws while the NBA average hovers around 75%. That may not sound like a huge difference, but over the course of a season and career, the difference adds up. On the opposite end of the career free throw accuracy spectrum was Shaq, who made just 52% of his free throws over a 20 year career. At one point, Barry offered to teach Shaq how to shoot underhand, but Shaq flatly rejected the offer, saying: "I will shoot negative-30 percent before I shoot underhanded." In other words, Shaq would've rather harmed his career and hurt his team -- and looked cool while doing it -- than look ridiculous and be a better teammate and player. He'd rather fail conventionally than succeed unconventionally. This is really the bottom line: not whether you dare to be different or to be wrong, but whether you dare to look wrong. Making a big call in public view or in front of a smaller group of esteemed peers isn't easy and it's often safer for your reputation to make a less consequential bet. As Marks notes, though, this is a recipe for average returns. Now, you don't necessarily need to make off-the-wall investment choices just for the sake of making them, but in order to achieve superior returns you do need to get comfortable with looking stupid every so often. In my experience, there is an inverse relationship between the praise you receive from an investment decision and your returns from that investment. No guts, no glory. Earlier this week, Fidelity posted an interesting article on Morningstar.com that discussed the importance of considering dividends from both a historical and forward-looking perspective. While equity-related metrics like FCF cover are absolutely critical in dividend analysis, we simply cannot afford to overlook a company’s balance sheet and its ability to repay its creditors. After all, a company can’t consistently direct undue amounts of cash flow toward common shareholders at the expense of creditors; otherwise, the firm risks a credit downgrade and higher borrowing costs, which, all else equal, will eventually trickle down to the bottom line. Specifically, firms with particularly high dividend yields could be under pressure from creditors to redirect more cash flow toward repaying debt. As such, you want to look for companies that strike a healthy balance between satisfying creditors and rewarding shareholders, as they’ll be more able to obtain favorable borrowing terms without harming their ability to pay dividends. This is one reason why why the Dividend Compass spreadsheet places a 25% weighting on leverage and interest coverage ratios. One strategy is to look for firms with investment grade credit ratings, being particularly careful with high dividend yield firms with credit ratings right on the border between investment-grade and junk ratings (BBB- or Baa3) as they may be more prone to cut the dividend to preserve their investment-grade credit rating. Even if a firm has a published credit rating, you don’t want to blindly take the rating agencies’ word for it. Consider the company’s debt/equity, net debt/equity, and interest coverage ratios and compare them to their peer and market averages. The same could be said for stocks with ultra-high dividend yields. There’s always a catch. Rarely will a stock’s dividend yield approach the top quintile due to dividend growth. Rather, high yields are almost always due to a depressed share price. 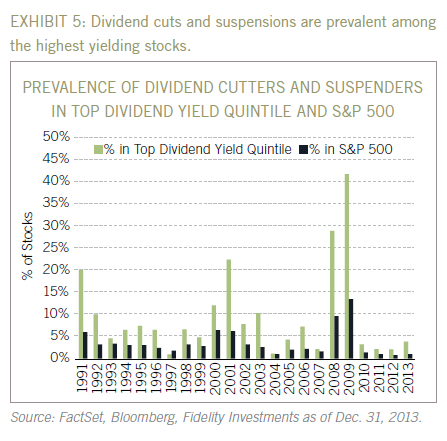 Because of this, it shouldn’t be surprising that dividend cuts typically come from the top yield quintile. If someone can point me to a case where a company cut its dividend after its stock outperformed the market over the trailing twelve months, I’d love to learn about it because I can’t recall coming across such a scenario. 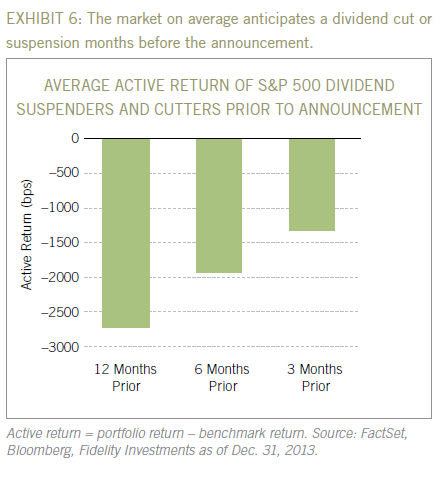 Unsurprisingly, Fidelity found in its research that a dividend cut typically follows a period of extended market underperformance. While the market may not discount the stock price specifically because of diminishing dividend health, a declining price (particularly relative to the market) is usually indicative of an intensified competitive landscape or at least a departure from “business as usual” for the company. What typically follows are contracting margins, greater uncertainty around net profits and free cash flow, and mounting pressure from creditors and the ratings agencies. None of this supports dividend health. This is why it’s so important to a) own firms with durable competitive advantages (i.e. economic moats) and b) keep tabs on how the firms’ competitive advantages are strengthening and weakening with time. 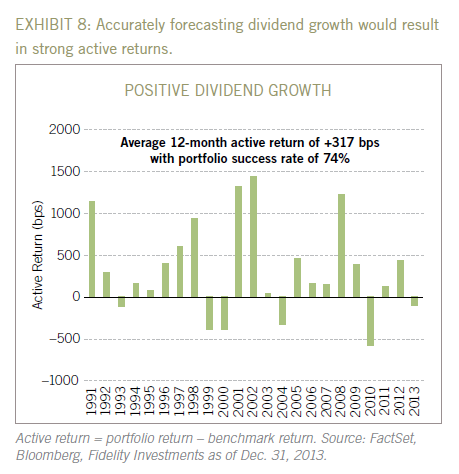 Getting future dividend growth correct is more than half the battle; however, is easier said than done. Still, it’s important to go through the process of determining a company’s dividend growth potential. At the very least it could save you from investing in a firm with deteriorating dividend health. How can we go about doing this? You can use historical data and trends as part of your forecast (this is what the Dividend Compass does), but we don’t want to make decisions solely on what’s happened in the rear-view mirror. 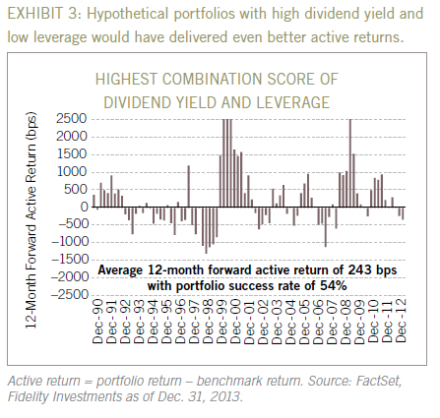 As Fidelity suggests, the best bet is to use a combination of historical perspective and forward-looking analysis. Fair enough, but any time you buy a stock you are already making an implicit forecast as the market’s outlook is baked into the current share price. Might as well make some explicit forecasts, I reckon, and hold yourself accountable for them. If you’re really interested in learning how to make detailed forecasts, NYU professor Aswath Damodaran explains it much better than I can both here and in his books.